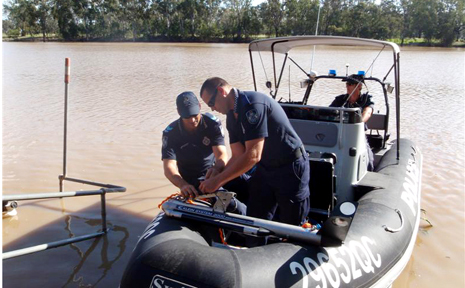 Search crews today found the body of a missing man in the Dawson River at Baralaba. Supplied. POLICE found the body of a 44-year-old Cairns man in the Dawson River overnight. It's a tragic end to the search for a man who went missing after attempting to swim across the river with a friend on Monday evening. The body was found just after midnight. Police are yet to formally identify the man. Search and rescue co-ordinator Senior Sergeant Nick Paton said the man and a co-worker had gone for a drive on Monday but were unable to get back across the flooded bridge. They had been at the Baralaba Golf Club and, with light fading, police said the pair had attempted to swim back towards the lights of the Neville Hewitt Weir camping ground after 6pm on Monday. “He (the missing man) got into trouble while crossing and was last seen heading towards the weir,” Snr Sgt Paton said. The other man had been pulled back to safety by a fisherman staying at the Neville Hewitt Weir camping ground. Both the rescued man and his saviour waited at the search-and-rescue base yesterday for any news. Police said there was no alcohol involved. The RACQ Capricorn Helicopter Rescue Service provided assistance to the search efforts on both Monday evening and Tuesday morning. The man had been staying in Baralaba with a co-worker for several weeks while working for Remote Building Solutions at Woorabinda.